The 10 Best BBQ Joints in North Dakota! 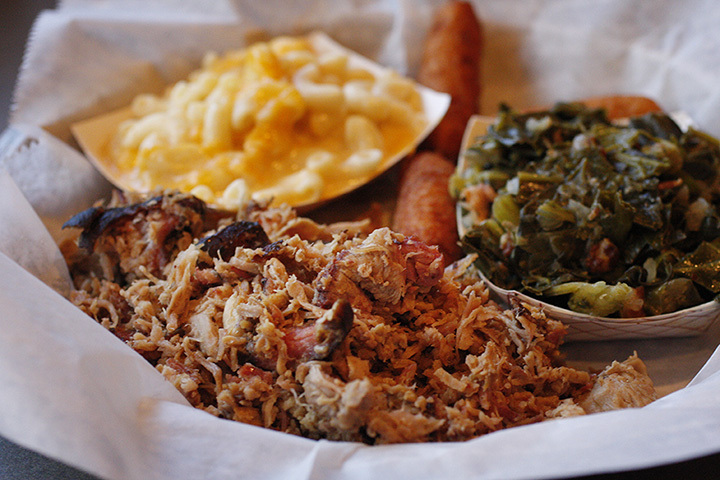 When you think of barbecue, the South may be the first thing that comes to mind. But guess what? The Midwest has some of the best barbecue joints in the country, as evidenced by the abundance of delicious eateries all over North Dakota. If you have a hankering for some hearty meat lathered in mouth-watering sauce, check out one of these excellent barbecue joints. “Satisfy your meat tooth” at one of Fargo’s newest restaurants. With a diverse menu that includes everything from beef brisket to Northern Oak smoked ribs, a visit to NoBull will undoubtedly leave everyone in your group full and happy. Feeling adventurous? See if you can tackle the Picture Perfect Platter consisting of a pound of pulled pork, five rib bones, three smoked sausages, five fresh buttermilk infused fried chicken fingers, slaw, dressing & gravy, best beans, and pickles & bread. The Hula Grill was established to bring a bit of Hawaii to North Dakota. The result is some of the best ribs in the state. With unique flavor combinations that you won’t find anywhere else, the Hula Grill will truly provide you with a one-of-a kind dining experience. Don’t forget to brush up on your hula dance. One of the newest restaurants on our list, Taylor Made is a locally owned and operated barbecue joint that aims to provide area residents with authentic Texas barbecue. Taylor Made specializes in three distinct sauces: Korean BBQ, Texas Sweet BBQ, and Horseradish. Any one of the three will leave you breathless. If you want barbecue in the Red River Valley, you go to Spitfire. All their meet is wood-fired and smoked daily. The result is a little bit of award-winning heaven. Try their barbecue chicken, made with a house sauce that will spoil you for all other barbecue. A retail shop and deli, Firehouse has everything you need to make your next barbecue the talk of the town. If you are more interested in having a sit-down meal, they have that covered as well. Firehouse carries a wide variety of spices and rubs, as well as the best barbecue ribs in town. Regardless of what you are looking for, you will find it here. Home of “the best racks and butts in town,” JD’s has mastered the art of barbecue and is kind enough to share it with all of us. In addition to offering the best barbecue in town, JD’s also has over 30 beers on tap, giving you a plethora of reasons to give the restaurant a try. If you are feeling especially daring, giving their hottest sauce a try. Only the strong survive. Although Dickey’s is a national chain, its only North Dakota location lies in Minot. All meat is slow-smoked in hickory wood burning pits on-site, giving you the freshest and most delectable meat around. Their pork ribs are a favorite, as is their barbecue honey ham. Another restaurant that appears to have mastered the art of creating one-of-a-kind barbecue flavors, Wild Hog has a diverse menu that will not disappoint. Give the Wild Hog challenge a go if you dare. It is comprised of a half-pound of pulled chicken, a half-pound of pulled pork and a half-pound of beef brisket topped with honey barbecue sauce, lettuce, tomato, onions and a pickle all on Texas toast, plus a half-pound of French fries. Many enter, but few come out alive. A Grand Forks staple for decades, the Speedway is known for its deliciously diverse menu. Although it offers everything from burgers to steak, its barbecue ribs are the stuff of legends. Have a hearty appetite? Give the BBQ Feast a try. Ribs, pork, and brisket—oh my. Home of the Drunken Pig sandwich, Lush Lola’s is famous for their beer-braised meat. What is the Drunken Pig sandwich? Only a little bit of heaven here on earth. It is pork shoulder that has been slow-cooked in beer and Lola’s Grill Seasoning for a minimum of ten hours. It is then topped with Captain Lola’s Rum BBQ sauce.